–WHY do people like paintings? Why do they hang them in their homes and offices and travel to see museum exhibits? More people attend museums and galleries than any other cultural activity–more than theater and concerts. Approximately 850 million people visit American museums each year–more than the attendance at all major league sporting events and theme parks combined. On my walk this morning I passed a cafe and began wondering about the social lives of the people sitting in the courtyard. When I got home, I began thinking about a call I needed to make to my gallery. I wanted to broach some ideas about how to garner more attention and possibly write some articles for art magazines. Over breakfast, I thought about an upcoming painting trip, mentally reviewing spots I might like to paint. While I walked, ate, and took care of morning tasks my mind was generating a rich imaginary world. Except for the ground I walked on and the food I ate, the primary experiences of my morning took place in my imagination. As I thought about it, it seemed as if most of our lives take place in the world of our imaginations; setting goals, planning creative projects, worry, watching movies and TV, playing video games, reading a book, or reading this blog. All of these experiences take place in the mind and generate differing states of consciousness. Reading a book is entirely different from reading a graphic novel. The reason I prefer one book over another is the level of absorption the work produces. I want a book to be so engaging I lose awareness of the physical world. Great art allows us to escape the burden of our own consciousness. In a recent podcast, I quoted Mark Rothko who wrote that "painting is not a record of an experience; it is an experience." There are paradoxical aspects of this statement, but the idea is that somehow a painting is a primary experience. But it is also an imaginary experience that evokes an emotional state akin to watching a movie or reading a book. Yet unlike a book or a movie, a painting exists only in space, and not time. Although a hallmark of a great painting is that over time you discover an infinitude of meaning and detail, you nevertheless see a painting instantly. In one moment you are exposed to its entirety. Stillness combined with immediacy are aspects that make a painting an indispensable facet of the human experience. A painting instantly conveys a freight load of information that can only be assimilated subconsciously. It creates an imaginary, psychic world the viewer can inhabit with the glance of an eye. For these reasons, paintings remain one of the most important of our imaginary experiences. When we place paintings in our homes we control, stimulate, and nurture our imaginary world. 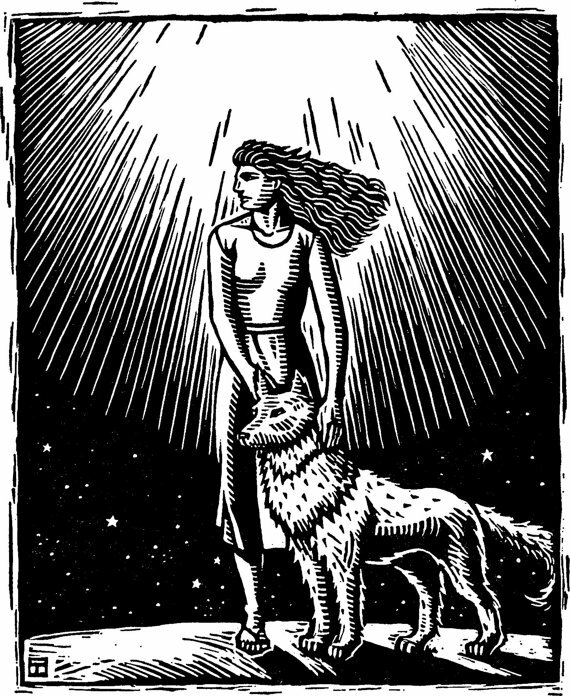 Above: Women Who Run with the Wolves, limited edition woodcut, available here.